It will be mildly inconvenient learning how to spell Damore'ea Stringfellow's name if the Eagles draft him. Damore'ea Stringfellow, WR, Ole Miss (6'2, 212): (1) Alabama at (11) Ole Miss, 3:30 p.m.
Stringfellow was ranked the nation's No. 10 receiver by rivals.com coming out of high school, but trouble began after his freshman season at Washington. He was arrested for assault stemming from a fight following the Super Bowl and pled guilty to three misdemeanors. Washington suspended him and he decided to transfer, signing a nonbinding agreement with Nebraska. After a trip to Ole Miss, however, he switched his commitment to the Rebels. With bridges burned at Washington and Nebraska he again found trouble at Ole Miss. After sitting out last season because of transfer rules he was arrested in Jan. 22 on charges of disorderly conduct. In the 2016 NFL Draft, the Eagles showed that they are willing to take chances on talented players with off-the-field issues, when they drafted Wendell Smallwood, Jalen Mills, and Alex McCalister. 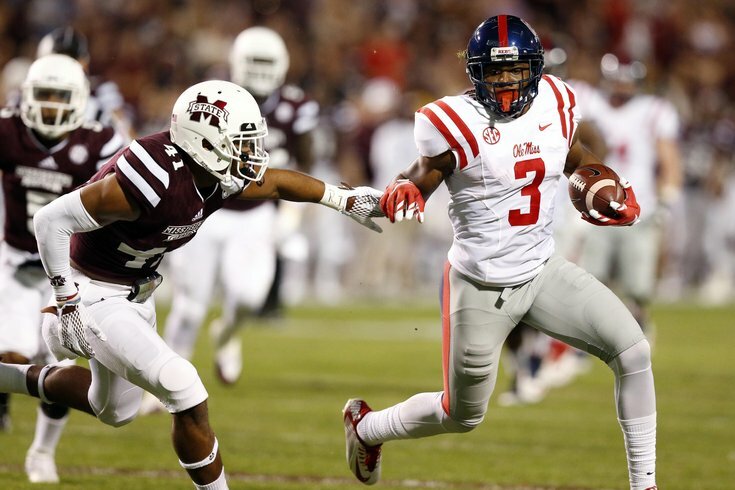 However, he is expected to become Chad Kelly's go-to target with Laquon Treadwell having left for the NFL. Obviously, the Eagles need help at wide receiver. Reuben Foster, LB, Alabama (6'1, 240): (1) Alabama at (11) Ole Miss, 3:30 p.m.
Foster is the next man up, and a potential Day 1 or Day 2 pick, playing in the middle of Bama's defense. He's likely a MIKE at the next level, which would mean that if the Eagles had interest, they might have to consider shifting Jordan Hicks to the WILL spot and moving on from Mychal Kendricks. James Conner, RB, Pittsburgh (6'2, 240): Pittsburgh at (21) Oklahoma State, 3:30 p.m.
After a 2014 season in which he rushed for 1765 yards, in Pitt's first game in 2015 Conner tore his MCL and was lost for the season. In December he was diagnosed with Hodgkin lymphoma. In May of 2016, Conner announced that he beat cancer. Charles Harris, DE, Missouri (6'3, 260): (18) Georgia at Missouri, 7:30 p.m. They're likely to have another first or second round pick in the 2017 NFL Draft as well, assuming junior Charles Harris comes out. Harris' stats over his first two seasons at Missouri aren't eye popping (9 sacks his first two seasons), but his skills are. Watch the following video against Florida. A few things stand out -- He has an outstanding burst off the snap, a great spin move (both ways), he hustles, he isn't fooled by misdirection, and he has counter moves if his initial pass rush move doesn't work. I can see this dude doing a lot of damage in a wide nine defense. Mike McGlinchey, OT, Notre Dame (6'7, 310): (12) Michigan State at (10) Notre Dame, 7:30 p.m.
McGlinchey is a Philly native who has played RT throughout his career at Notre Dame so far, but will move to LT with Ronnie Stanley having moved on to the NFL. That'll check off some versatility boxes for Doug Pederson if McGlinchey can play well on the blind side in 2016. He was also named one of four team captains for the 2016 season.